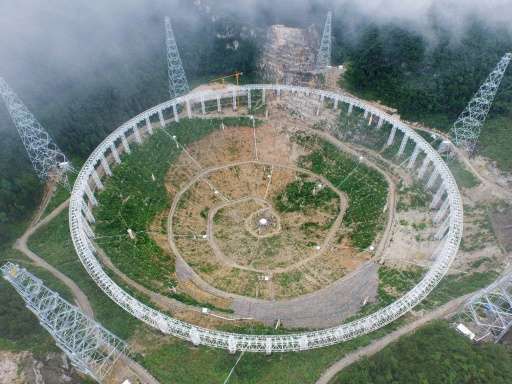 China will move nearly 10,000 people to make way for the world's largest radio telescope which promises to help humanity search for alien life, state media reported on Tuesday. The relocations will "create a sound electromagnetic wave environment", it cited a top regional official named Li Yuecheng as saying. Residents will receive 12,000 yuan ($1,800) in subsidies for their troubles, with some getting extra support for housing, it said. FAST, built at a cost of 1.2 billion yuan, will dwarf the Arecibo Observatory in Puerto Rico as the world's largest radio telescope, which is some 300 metres in diameter. Xinhua earlier cited Wu Xiangping, director-general of the Chinese Astronomical Society, as saying that the telescope's high level of sensitivity "will help us to search for intelligent life outside of the galaxy".